The Spirit XT 285 treadmill is a very sturdy unit which has a lot of reliability and functions well for most users. 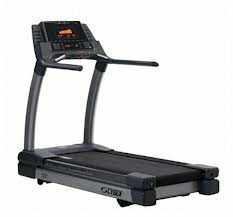 Overall this is a good treadmill for most users and has plenty of reliability. However, because of the price alone I would not recommend this unless you can find it on offer somewhere. The Cybex 750T is in the same kind of price range and often found cheaper, yet has even more features than the Spirit XT285. The advantage that the Spirit treadmill has though is it’s much more reliable and has a far better warranty, so for long term use it might still be the better option. Spirit Fitness are an American company founded in the early 80’s. Their focus is and always has been on providing high quality equipment for all levels of user. This is reflected in the reliability of their products and the massive warranties they come with. Simply put – buying a Spirit product gives you peace of mind that it will either last for many years, or be replaced/repaired as needed thanks to warranty coverage. This reliability is one of their main advantages over other brands. Spirit also make other cardio equipment such as rowers, elipticals and bikes. In my decades of experience with gyms and the fitness industry overall, Spirit has always been known as a highly reliable brand. They may cost more than similar brands, but the value comes from their products lasting a lot longer than rival versions. Heart rate belt included so you can monitor heart rate constantly without needing to hold the handles. With a 7.5” backlit LCD screen, the display on the XT285 is easy to see while using it, in dim or bright light. The screen isn’t the absolute biggest around but it is a reasonable size and big enough to have all the relevant info visible. There’s also enough room to display up to 9 different pieces of info at any time. That allows you to track details like time, calories and distance all from one screen. Having no need to switch between screens is a massive plus. Very Reliable, Will be Good for Years! The reliability of Spirit products is a massive plus point. They are known for creating products that run without any problem for many years at a time. This applies even to commercial equipment – there are many gyms using Spirit treadmills and other equipment. The frame gets lifetime cover which is expected from any decent brand, although it should be noted some other expensive brands don’t even cover the frame for more than a few years. Deck is usually decent with other brands too, though again Spirit have gone for lifetime cover. Treadmill motors usually only get a few years of warranty because this is one of the most heavily worked parts in a treadmill. It’s often the first major part to go, but the Spirit XT285 is so reliable that it even has lifetime cover for the motor! Small parts such as the belt and other fittings are covered for 10 years, with labor getting 1 year of coverage. So basically, even if something does go wrong within the first 10 years, you will only need to pay for labor on the repairs – an extremely fair deal for any user! Using this treadmill is a wonderful experience. It’s very easy to get the info you need thanks to the display and simple console, and a nice program variety will keep things interesting for you. There are easily accessible buttons for the incline & speed settings located on each arm of the treadmill too, so you can make adjustments on the fly. 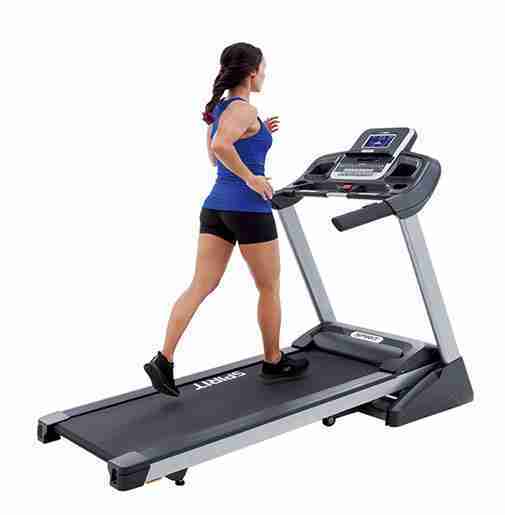 Having a strong deck and powerful motor also adds to this because it allows the treadmill to handle heavier users (up to 350 lbs) and go at a higher speed without struggling. Obviously the motor isn’t pushed too far, because it’s still intended to last for the lifetime of the product (see the Spirit warranty). There’s also an integrated speaker system which works by using a simple aux socket. This is the standard sound socket which would allow you to plug in a phone, mp3 player or tablet to play whatever you desire through the built in speakers. The speakers themselves are a decent quality too, giving enough volume for a home user and having minimal distortion. Another lovely feature of the XT285 is that it has an adjustable built in fan. You can adjust the position so that it’s in the right place for you or even keep it on a swivel setting. Either way it does a great job of helping keep you cool during a workout, which could be the little edge you need to push that bit further. Of course pretty much every treadmill has heart monitoring nowadays. We’ve all seen the silver metallic handles on treadmills and other cardio equipment, which detects your pulse over time and gives an on-screen readout of your current heart rate. Spirit take it a step further though and provide an actual chest strap with this treadmill, so you not only get a more accurate reading but you also get it without needing to hold on to the central bar of the treadmill for a while. Holding on to the bar is bad for running form because you can’t swing your arms, and that limits performance. Having a chest strap allows you to monitor heart rate through the entire workout without any of that hassle – a very overlooked feature! Having an incline which goes all the way up to 12% and a maximum speed of 12mph is a great feature. Many mid-range treadmills will only incline up to 10% and go up to around 10mph in speed. 10% incline is usually okay for most beginner or intermediate users. Having the extra couple of notches can make a really big difference though, and most people will be happy with the Spirit XT285 when it comes to incline. For speed having an extra couple of mph is vital. Many low to mid-range treadmills are capped at 10mph, which isn’t very fast even for an intermediate user. The extra bit of speed allows a lot of users to actually sprint instead of just do a quick jog. That also means interval type training is much easier to do. This is a fine treadmill for most sized people to use, and with a weight capacity of 350lbs it’s good for heavier users too. Tall users with very long stride lengths might struggle with this deck though. It isn’t an extra-long version which is what many commercial gyms would have. Instead this is an average sized home treadmill, so there’s a little more focus on space-saving. The folding treadmill design is great for storage though! Whilst the speed and incline on the XT285 can both be taken quite high, it is still not a match for performance treadmills in either category. Advanced users definitely need something with more capability. Likewise there are a good number of training programs, but again the variety isn’t as big as it could be. There’s also the fact there are no options to create a workout of your own and no negative incline. In other words this treadmill is great at the basics, but can’t do anything special. There aren’t any user specific settings either. You can’t fill in your info and have it saved so you can better figure out your workouts or calorie burn, and with this lack of memory there’s also no integrated way to track your workouts or progress. Again that might not seem like a big deal, but at the price range Spirit is offering this for, these kind of extras should probably be included just to sweeten the deal. As I’ve already touched on, this is priced quite high relative to the features it has. It’s understandable because there’s real build quality here and Spirit as a brand provide plenty of reliability. The warranty basically means you’ve got a guaranteed treadmill for the next 10 years, but that still doesn’t quite make up for the cost in my opinion. In all my time using fitness equipment, one thing I’ve learned is that value comes on a sliding scale, if you know what I mean. You can buy a cheap item that has good value because it lasts or has good features. As the price increases, you expect that value to increase as well, meaning there should be more features or reliability. With the Spirit XT285 there is absolutely loads of reliability and a great treadmill. It’s just that the price is too high for what it actually offers. Take the Cybex 750T for example. It’s a cheaper treadmill than this one and has more speed and incline, offers a decline setting, and is customizable. Why is it cheaper then? Because it has a much lower reliability. So again it depends on what you want really. Are you looking for a solid beginner-intermediate treadmill that will last ages and doesn’t need much in the way of features? Then sure, grab an XT285. If you do want features as well though, are looking at advanced use, or aren’t so fussed about your treadmill lasting over a decade, you might want to look elsewhere.